Joyous Mexican World Cup Fans Trigger Earthquake Sensors! Mexican fans celebrating their World Cup win are thought to have set off earthquake sensors, according to the Institute of Geological and Atmospheric Investigations. The institute notes that tremors registered at two different sites in Mexico City just seconds after player Hirving Lozano scored. The goal resulted in a surprise Mexican victory over Germany. The Institute of Geologic and Atmospheric Investigations reported that the detected earthquake was triggered in an "artificial matter," and suggested that it was "possibly because of mass jumping." After the goal, people began pouring into the streets, celebrating and embracing one another. Cars honked, Mexican flags waved, people chanted "Mexico! Mexico!" and fans sang the unofficial Mexican soccer anthem, "Cielito Lindo." Mexico beat Germany with a final score of 1-0, allowing it to proceed to the next stage of the World Cup along with 15 other team. The Mexican team has not made it past the round of 16 teams in the last six World Cups. Fans are jubilant that their team has a chance at reaching the quarter- and semi-finals. Mexico City's local government estimated that 75,000 people were gathered in the capital's main square, and another 20,000 were at the Angel of Independence monument. The streets were so full of celebrants that authorities had to close it off to vehicular traffic. Many Mexicans noted that they didn't think their team would win the game and some didn't even feel like watching the game. People in Mexico are polarized with the elections coming up on July 1st, as well as distressing news from the United States regarding migrant children being separated from families at the border and the Trump administration's plan for a border wall. Mexican citizens reported feeling united after the win, with hope bolstered for the future, a reminder that nothing is impossible. Mexico will play South Korea on Saturday and Sweden on June 27th, 2018. 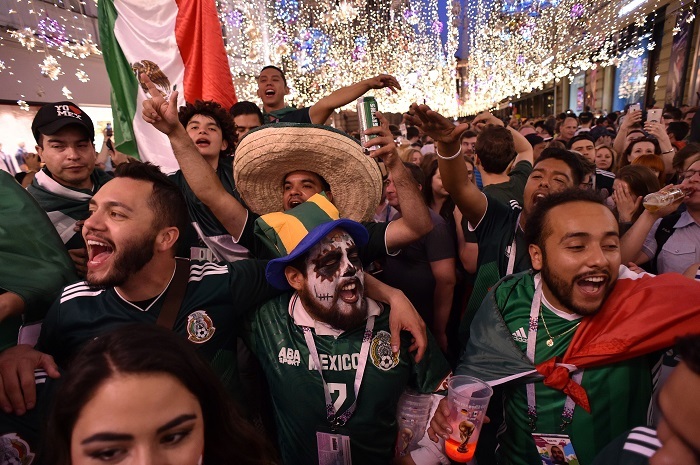 While it is uncertain whether they will score the victories necessary to advance another stage, Mexican fans are relishing the exuberance of this moment and say their faith has been renewed.